Cockroaches are the most common type of household pest and the bane of restaurants and food storage areas. They are also found in retail establishments, offices, industrial buildings and transport vessels and vehicles. Cockroaches feed on crumbs and dried liquids remaining on counters, floors and other surfaces. Heavily attracted to water, they enter homes and businesses through sewers, drains and composts. They are notorious disease carriers known to cause gastroenteritis, dysentery, hepatitis and tuberculosis. Shedded cockroach skin, droppings and dead bodies can trigger allergies and asthma attacks. You know you have cockroaches when you see them or their droppings, which appear as small black dots. Sometimes you can hear their clicking in very quiet environments. 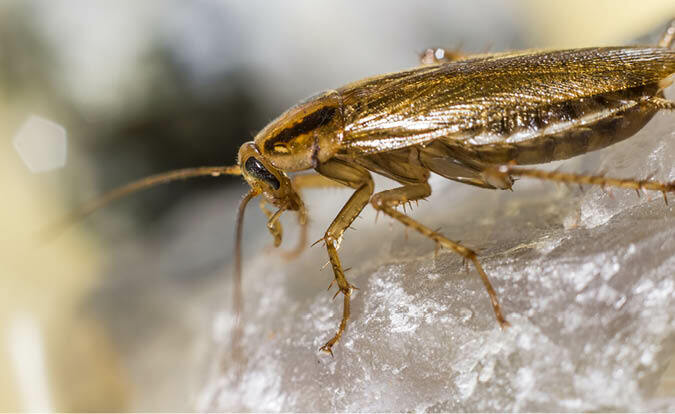 The appearance of one cockroach is usually a sign that more are hidden in darker spaces of your home or business. GPS specialists have top-notch products to eradicate your roach problem. We will spray all affected areas both inside and outside your home or business, including inside and between cabinets and behind appliances as well as bathrooms and laundry areas. Cockroaches have evolved over millions of years and are found throughout the world. Common species include brown-banded, American, Asian and German. Their eggs are immune to many over-the-counter insecticides. Cockroaches survive on the food, water and shelter provided by homes and businesses and reproduce quickly. They can enter a building through any opening—doorways, cracks, crevices, vents, and sewers and pipes. They can also be carried in by containers such as grocery bags, boxes and purses. Cockroaches are nocturnal and come out from hiding to feed on discarded crumbs and dried liquids found on surfaces and inside appliances. The best way to keep cockroaches from infesting your space is to keep your surfaces clean and doors, windows and vents dry so they are forced to seek shelter elsewhere.